Fletcher, Ian. 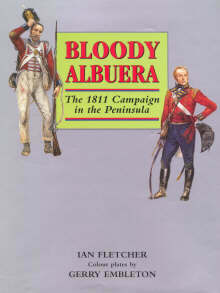 Bloody Albuera: the 1811 Campaign in the Peninsula Ramsbury: Crowell Press, 2000. 128 Pages. ISBN 1861263724. Color plates by Gerry Embleton. Maps and illustrations. $60. Hardcover. The year 1810 was not a good year for the Anglo-Allied forces in the Iberian Peninsula. The key fortress cities of Ciudad Rodrigo, Badajoz, and Almeida had all fallen to the French. Although they bloodied the French army at Busaco, the British and their Portuguese allies were forced to retreat hundreds of miles to the Lines of Torres Vedras, which protected Lisbon. There Wellington waited for the French Army, under Marshal Masséna, to do something. The fortified lines were too strong for the French to attack, so Masséna did nothing but wait. At dawn on 5 March 1811, the British sentries reported that the French were gone. No longer would the British being constantly on the defense, re-acting to French moves. Instead Wellington began the first of his offensive campaigns that would end three years later with the French expelled from Spain and the British occupying France. The year 1811 was pivotal. The British chased the French out of Portugal, never giving them a chance to regroup until they under the protection of the fortress of Ciudad Rodrigo. The rest of the year saw a joint British-Spanish expeditionary force operating in southern Spain, numerous small actions, raids, sieges, plus three major battles that were victories for the British. By the end of this year, a year that began with the British besieged in Lisbon, Wellington and his army were poised to the take war into Spain. Bloody Albuera tells the story of the eventful year of 1811. It begins with an overview of the Peninsula War and also devotes a chapter to both Wellington’s Army and the French. Each chapter covers a major event of the year, such as the French retreat from Portugal, the battles of Fuentes de Onoro and Barrosa, and the abortive siege of Badajoz. Mr. Fletcher uses memoirs, letters, and diaries of those who fought at these battles to describe them and the reader is left with an appreciation of what it was like to be a soldier caught up in the events. Three chapters (twenty-five percent of the book) are on the battle that gave the book its name: Albuera. There, Marshal Beresford, commanding 35,000 British, Portuguese, Spanish, takes on a French Army, of equal size, under Marshal Soult. This battle is the bloodiest for the British Army of the Napoleonic Wars and was one of unsurpassed heroics on both sides - young British officers dying defending the regimental colors, epic cavalry charges, Spanish infantry standing in line and repulsing French cavalry, and a exchange of gun fire that left thousands dead or wounded. The first chapter covers the charge of the Polish lancers that caught three British regiments in the flank and destroyed them in less than ten minutes. (Mr. Fletcher provides accounts by British officers who were on the receiving end of a Polish lance!) The second chapter covers the devastating firefight, between two brigades of British infantry against two French infantry divisions, which decided the battle and gave rise to the “Die Hards” legend and the invincibility of the British Fusilier Brigade. As in the previous chapters, Mr. Fletcher intersperses a very readable description of the fight with first hand accounts of the action. Bloody Albuera provides little new information for those who study the Peninsula War. Its real strength lies in its artwork. Mr. Fletcher had done a superb job illustrating his book. It has 8 original color uniform plates by noted military artist Garry Embleton, 97 black and white pictures and paintings, and 11 maps! The uniform plates show the uniforms that would have been worn by the soldiers on campaign in 1811 and the figures are all in action poses. The maps are well drawn and are placed appropriately with the text (something many books fail to do). The black and white images are incredible! Some show the battlefield as seen today, but many are by contemporary artists. Mr. Fletcher has gathered a large number of rarely seen paintings and drawings that will astonish the reader. (I have been studying the Peninsula War for 25 years and had never seen 50% of them before!) He also explains many of the paintings, pointing out the incredible detail in some and uniform problems in others. When I first saw the book advertised, I thought that its price ($60) was outrageous! But when I picked it up, I quickly realized that just the pictures and paintings make it worth its price! But combine them with a very readable and authoritative text and it becomes a steal. This book will appeal to both those who study the Peninsula War and those who are looking for a quick read.